The School of Design is a new (ad)venture, which aims to create spaces and connect people, in an environment that is open and creative. Based in Birmingham, it aims to bring people together though the teaching and learning of traditional and sacred art forms, exploring history, heritage and culture. We will be offering things we don’t see anywhere else in the region, and meeting a need as and where we can. Our intention is to make every session as accessible as possible, and as affordable as possible. If you have any issues regarding this, please do get in touch, and we can work something out. If you would like any of our workshops to be held in your area, then ping over an email. Alternatively, there is something creative that you would really like to learn more about, and we can help by facilitating a workshop, please do let us know. You can send an email via the contact page on this website. Meanwhile, the first set of workshops were a great success and fully booked! 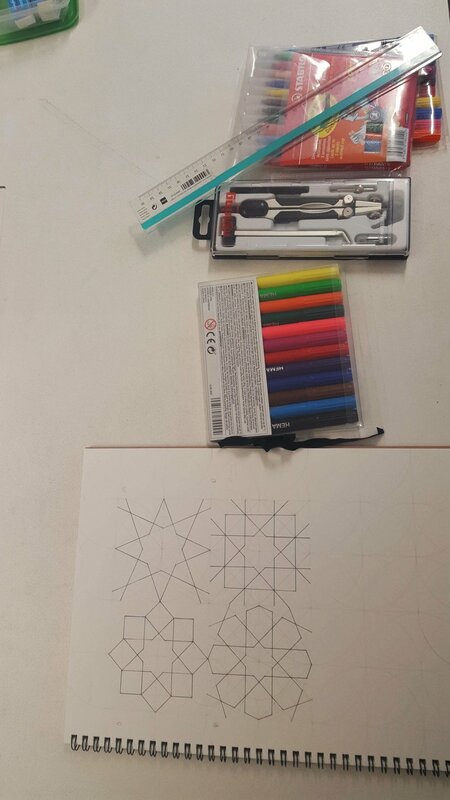 An Introduction to Islamic Geometric Patterns, participants were introduced to the principles of Islamic art that are found in architecture and manuscripts around the world, and guided through a step by step process. We learnt how to construct grids and draw beautiful geometric patterns that we see in heritage around the globe. All of this was done with the traditional methods of using a compass, straight edge and paper. We are planning more workshops for the near future and over the summer, so watch this alternative space and keep in touch to find out more. If you would like ot be added to the mailing list, send a message via this website, and we look forward to meeting you soon! Here are some pics we managed to take whilst workshopping. For more pics and participant reactions, check out Instagram stories.